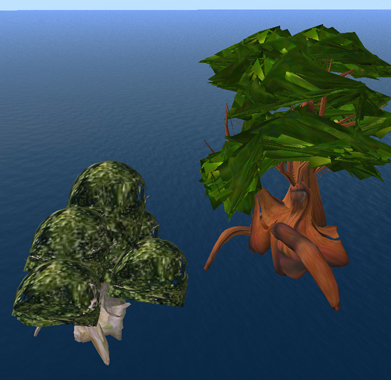 OK, I’m not sure at what revision this happened, or who contributed the patch to do it….but last night, I logged in after working in OpenSim a bit in the morning…and discovered my prim hair still firmly attached to my head! In a state of disbelief, I logged out and back in, to see if it was a fluke. No, there was my hair, on my head, correctly placed. 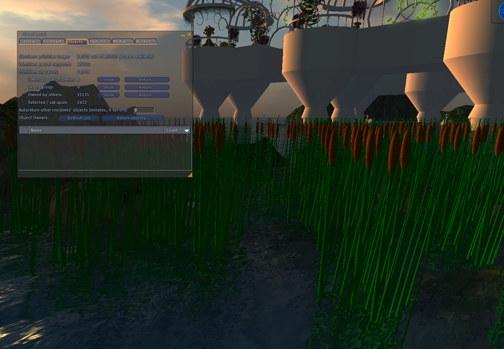 Unconvinced, we rebuilt the region with the newest version of OpenSim code…I logged in…and there…was…my….prim…hair. Attached. Correctly. On my head. Behold: Hair. Jewelry. Sunglasses. Flexi Skirt. Yay! Shengri La Dream emerged from the protosphere over the weekend and landed next to Shengri La Spirit. 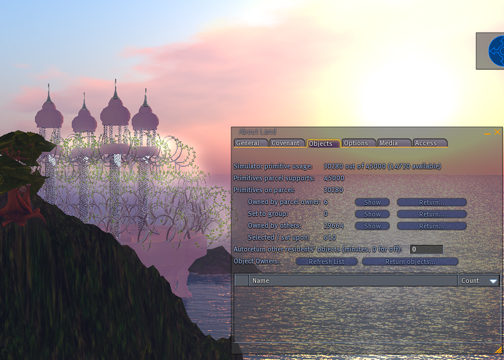 I show the first views of Dream, which will be used to develop content and to push on the inventory aspects of OpenSim. One of the first things I’ll be doing is dumping in a lot of my textures that I’ve developed over the past three years so we can start to develop a reasonable sized avatar inventory. Then I’ll start developing a range of mesh garments, skins and of course, prim-based content such as jewelry, shoes, and other attachments. 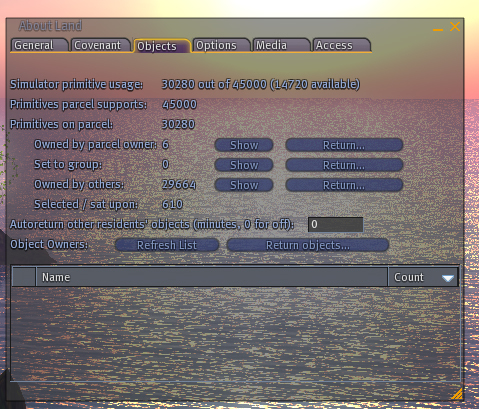 This will allow us to find the functional limit of OpenSim and start getting some performance benchmarks as I build out and add to my inventory. 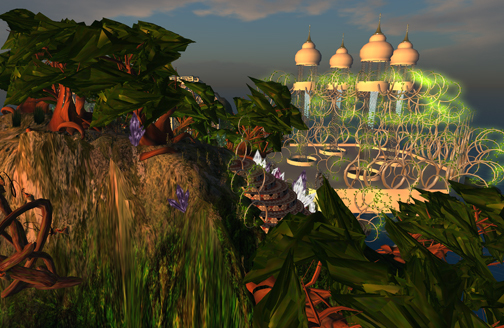 An early view of the 40,000+ prim build on the collaborative OpenSim, Shengri La Spirit, built by the Fashion Research Institute on the IBM-hosted OpenSim platform. I’ve had requests from people to enter Spirit. Spirit is a closed research build. This means that we are only letting people from our Fashion Research Institute-IBM development team into the sim. It’s a very short list of people with permission and access. Less than seven, in fact, and we call them out in this blog. But because so many curious people want to see what Spirit looks like, I present to you this machinima. I have many talents. Machinima, pretty clearly, isn’t one of them. 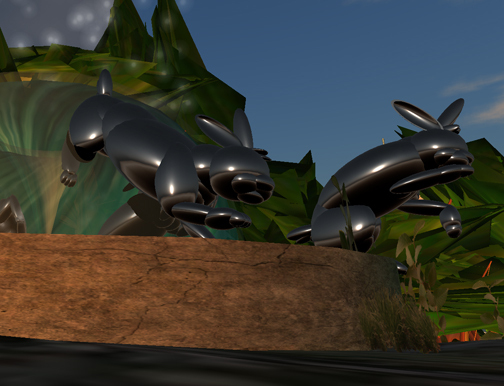 I’ve received several comments with wild-eyed claims and various anecdotes about OpenSim, including a recent one about a simulator with a build of 100,000 prims. Folks, this entry is for you. While I’m waiting for Spirit to be groomed and tweaked and made ready for my next assault, I’m going to take the opportunity to talk about why we’re doing what we’re doing. The Fashion Research Institute didn’t actually set out to be alpha testers of open source code. 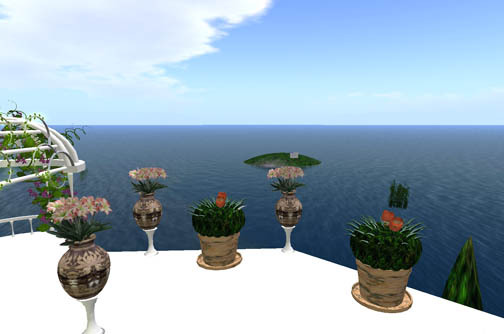 As CEO of the Fashion Research Institute, I’ve done my due diligence about virtual worlds. I personally have explored all of the virtual worlds out there in the last year of developing the Fashion Research Institute, and our virtual world-based product design and development technology solution. But after a hot-eyed tour of the many virtual worlds out there: Blue Mars – stunningly beautiful. World of Warcraft – lots of users. Stardolls? 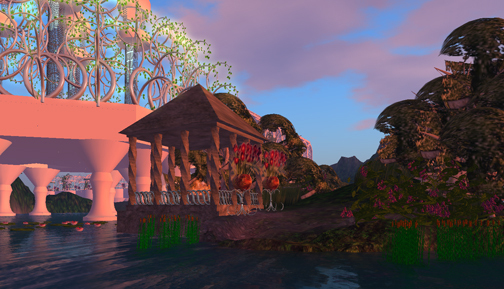 Shopping for the tween set…and the many other worlds out there…it became crystal clear that none of the existing virtual worlds was going to be what we needed for our solution. 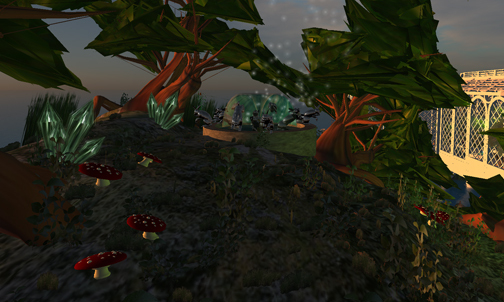 These virtual worlds all had issues, not least of which is that most of them are games. Entertainment for the marketing demographic of choice, which means we can’t use it for our solution – the Fashion Research Institute isn’t serving the media and entertainment industry. We’re building an enterprise-ready virtual world-based technology solution. There’s nothing playful about it, unless you regard business like Edith Wharton: “He had the Saxon love of games, and the best game of all was business.” We’re in business in the apparel industry, and part of our business demands that we have an appropriate platform. As I’ve reiterated at my many talks, the real value proposition for virtual worlds isn’t in marketing or serving the consumer base. It’s in helping enterprises succeed at their business by using virtual worlds to enable their work flow – at which point, the consumers will follow. The Fashion Research Institute was facing a dilemma. 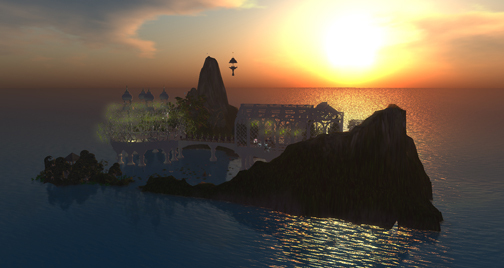 Second Life tm has graphic quality that is ‘good enough’, and a richly immersive experience. But Linden Labs’ tm Terms of Service agreement alarms me as an entrepreneur. It’s fine for individuals, but an enterprise that is serious about their business information and intellectual property would never allow their proprietary information to sit on a Linden Lab server. And then, OpenSim was presented to me as an option. It was an option that was ringed and garnished with a lot of cautious warnings like ‘well, you know, this is very alpha code’, and so on. And at the point where I first went in, in October of 2007, it really was quite rocky. But it was also very clear that it was our future, and I’d better embrace it. And to that end, I had my people set up the first of our OpenSims, and we started playing with them. I now have the abandoned ruins of four or five OpenSims laying about on my boxes, and of course, Shengri La Spirit alive and well on an IBM-hosted Blade. Fast forward to where we are now: testing the code. 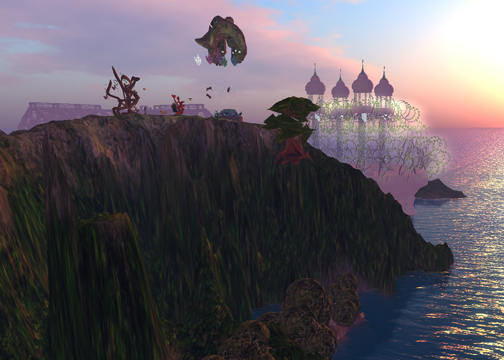 And, I’d like to think, doing a service to the OpenSim community, and in the spirit of open source, making our data available for everyone to see and use, in the form of this blog, and feedback from Kurt, Sean, Dale, and Zha into the community. Open source means just that: being open about what you are doing, and showing your work. Being transparent about it, so everyone can benefit. 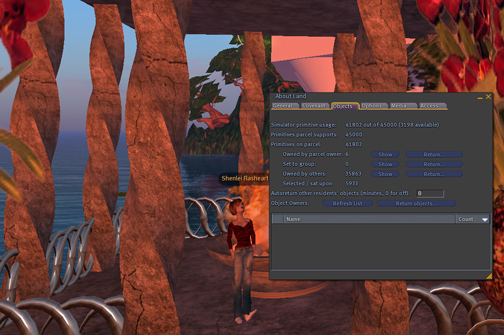 For example, I’ve had a lot of technologists tell me that the prim limit in OpenSim is arbitrary. I am first and foremost a visual learner – I like to look and see for myself….and that means actually seeing the performance limitations for substantive builds. Now, it is true, I could have just asked my IBM team to create a script that would have rezzed prims in a loop till the system ground to a halt. It wouldn’t really have impressed anyone, particularly those who write loops. And we wouldn’t have learned anything in the process – a machine cannot alpha test because it isn’t human and it does not have the sensitivity to learn from the experience. All it would have done is dumped in as many prims as it took to grind the machine to a halt. But having a server full of prims, with no active observer, or worse yet, an observer who is unable to log and report what she observes, really doesn’t serve any useful purpose. You can’t actually learn where the FUNCTIONAL prim limit is – you know, the one where the overall user experience degrades to the point it becomes unacceptable to the human user – a clearly human condition that a program can never identify. So we’re building out to find and push the functional prim limit, on a specific box, and we’re benchmarking the performance of that machine, with the given installation, and with a lot of user parameters being fed back. I make no secret about the fact that we’re performance tuning as we go along; that we are not yet pushing textures, inventory, scripts, or a range of other parameters (that’s coming, soon enough). We’re systematically focusing on prim limits first, which in our case is a human-created substantive build that uses primitive-based objects, including basic system, tortured system, sculptured or flexible primitives. And we’re going to keep running out onto the ice until we fall through, at which point we will know where the functional prim limit is, for this set of parameters, and we’ll push it further. When we find that functional prim limit based on our parameters, tuned for the IBM Blade hosting it, we will have a benchmark, which we will share so that the OpenSim community also has that benchmark. I’m not clearing space on my calendar to beat on Spirit because I love games or alpha testing. I’m doing it to move the platform forward, because alpha testers who can actually test and provide worthwhile feedback are tough to find. And I’m talking about our work because I feel strongly that the results of my alpha testing are important to the community as a whole, and that there are some very dedicated and capable people out there who will grab the results of what the Fashion Research Institute is doing in our collaboration with IBM, and run with them. Personally, I cannot wait to see the results. 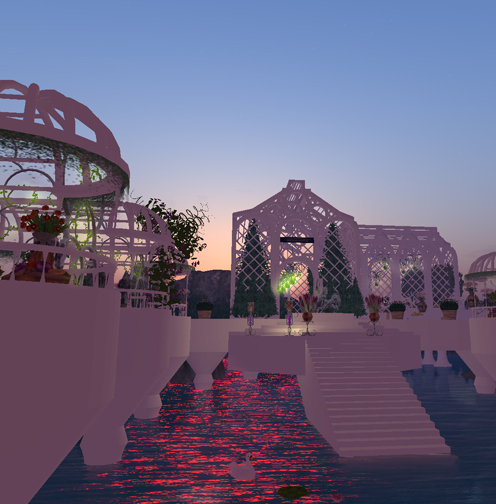 Thank you again, to all of the dedicated open source & OpenSim supporters, coders, programmers and technologists who share their work openly and publicly. You rock. I got a little excited about planting the island on the southeast corner of Spirit, and before you know it, I ended up with 41,802 prims. I honestly meant to have more self control. But, it didn’t work out that way. Spirit was a trooper and performed valiently, although I did notice that she was a little laggy towards the end, and didn’t really want to have anything to do with terraforming, especially not the smooth tool. Dumping stuff out of inventory wasn’t a problem, other than the one about how a prim or an object gets buried up to its center point in the ground. It’s not as bad as when your legs are suddenly bent at odd angles because of the terrain physics. I would love to see a better basic set of animations for the basic avatar. I really do miss my AO, but at least if the basic walk animation didn’t so closely resemble the stride of a chicken, it mightn’t be so bad. I was told that attachment points are now persistent. I guess we’ll see. If they truly are, then I’ll likely slack on dumping in content to Spirit and start focusing on, well, hair. And shoes. Shoes and hair. And jewelry. And maybe a nice matching handbag. It would be nice if the attachments themselves were persistent but I guess little steps for tiny feet. Teravus, I totally forgot to get the sim stats until long after I had logged for the day. Sorry about that, I’ll try to remember tomorrow when I go in to build. Today was a pretty good build though, overall. I finished off the corner of the sim, and started looking at the northeast corner. I have a plan in mind for a relatively complicated gazebo and some plantings. We’ll see how it goes. 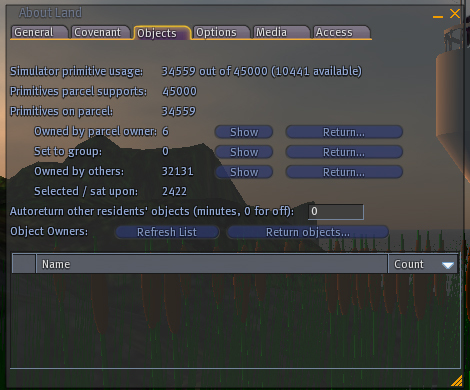 Final count for today’s efforts: 41,802 prims. Ok, ok, I know I promised I’d only dump a few hundred, max a thousand prims into Spirit at a time, so we could look at things. But it’s so difficult to stop when you have prim cattails and prim mushrooms and bunny fountains and crystals just waiting to be planted. At least it is for me. Your mileage may vary on this. OMG! Only 10,000 prims left! I’m starting to get a little worried. 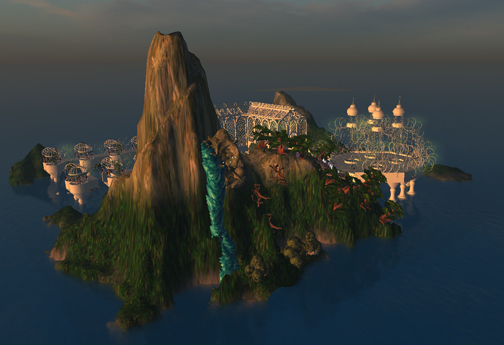 I only have 10,000 prims left to go, and I haven’t even tackled the back island…or the sea floor. And I want tea sets, and a lot of them. It’s troubling to think I may run out before I see my vision fully instantiated. O, the pain! Heh. Somehow, Spirit is just so comforting when the main SL tm grid plummets like a wingshot duck. It’s just there, with its own issues, but issues that are getting wrung out every day that passes. I wish I could say the same for the main grid. So tonight I went ahead and planted a few trees, finished the Sacred Grove, and added a few special touches here and there. My favorite has to be either the prim cattails or the cave of crystals. I can’t wait for our official photographer to get into Spirit. She did manage a brief log-in, and I discovered a really unique bug. I was trying to im her, so I clicked on her…and got the edit menu…and axes. So being the curious sort, I decided to see what would happen is I dragged the arrows around. Yup, you guessed it: her avatar came along for the ride, all around the sim, courtesy of an edit gone badly awry. Given that its little feet are peeking out from under the curtains, I think we can classify this as a bug. Hopefully tomorrow we’ll see Calli in and snapping away. She’s so talented, I know she will do justice to Spirit in all ways, especially its historic nature. I’m hoping that I’m going to get my promised ‘surprise’ this week, and Spirit can catch a breather and have a bit more tuning done. It’s very exciting and I just can’t wait! 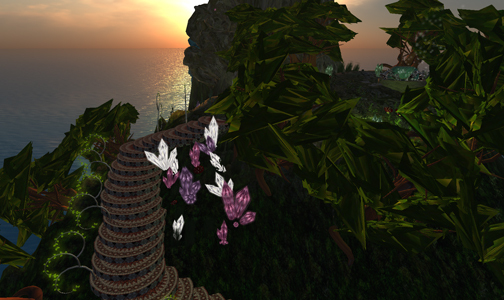 So the rolecall at the end of the day: 1/2 Calli, 1 Shenlei, and 34,559 prims in Shengri La Spirit! Yay! I finally managed to shake off my executive cares and figured I’d have time to go in and start the climb to the next 5,000 prims. That is one must confess, a really lovely idea. But, Spirit had other things in mind and for whatever reason, the last few days in Spirit has been more like a crash-and-burn every hour or so, sometimes less. Bleeding edge, ok, check, got it. The installation was wonkier than a high school freshman (I have a nascent one of those around the house, so I know from). Since Zha gives me a fresh build with all the new patches and updates everytime I crash the box, I’m always assured I’m working on the most recent code with the most recent patches. Which is usually pretty cool – I noticed, for instance, that the weird linking anomaly where the center of a set of linked prims defaults not to the combined center, but to the center of the root prim, has been fixed. Thank you, thank you, thank you to whomever of you fabulous code Ghod/desses who fixed that particular issue. Awesome work! I managed to crash the box about 6 times Friday, once so hard it even brought the Blade down (as opposed to just the OS installation). I always feel horrible when I crash the system. The entire process of getting it back up is time-consuming. I can’t ‘just’ hop back in after the system goes down like that. On the other hand, I did manage to generate a really interesting experience. I was in shooting a machinima (with a great deal of alt-camming and mousing around) and I crashed Spirit so hard the dust is still settling. After getting it back online, I went in and managed to, after alt-camming a bit, crash it again (not so hard this time). There is something about the process of ‘looking’ with alt-cam that causes the system to hang. I look around a lot with alt-cam. I do it more than I move my avatar, in fact. I’m always way out away from my av, building, and doing a lot of camming. That combination seems to be lethal after a certain amount of time/clicks/looks. 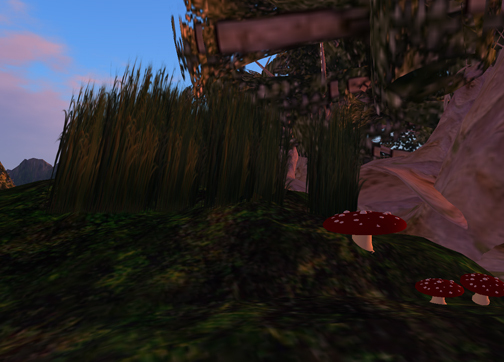 Although that may be tied in with alt/click/looks and a heck of a prim load. Tough for me to say where the issue is or what it is exactly, I just report on my experiences out there on the thin edge of the ice and hand my notes over to my IBM team liaison, Kurt. The machinima, by the way, is beautiful. I’m not the world’s best at taking pictures or machinima, but the subject matter is lovely, and in the windlight moonlight, it’s superb. Even with my bad camera shots. 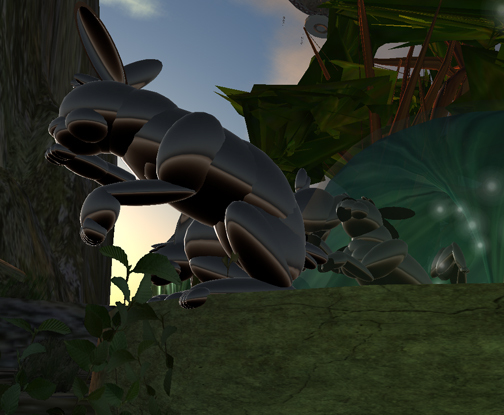 As soon as I figure out how to edit it and convert it, I’ll post the first moving images of Spirit, complete with all of its scripts and prims. Now, the good news: Zha managed to stabilize poor hemorrhaging Spirit and get it back on its feet. 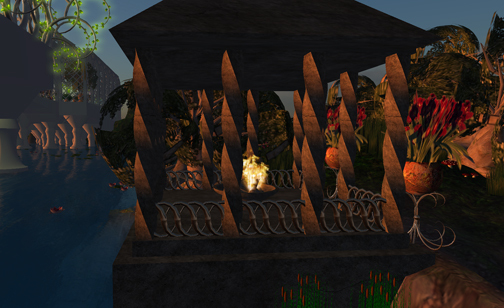 So I was able to get back in yesterday evening and get back on track with building towards 45,000 prims. As you can see, we’re now at 30,280 prims and heading into the ascent. The top terraformer on my crack IBM team is heading in tonight to tweak terrain and then I’m going to go head’s down on landscaping. 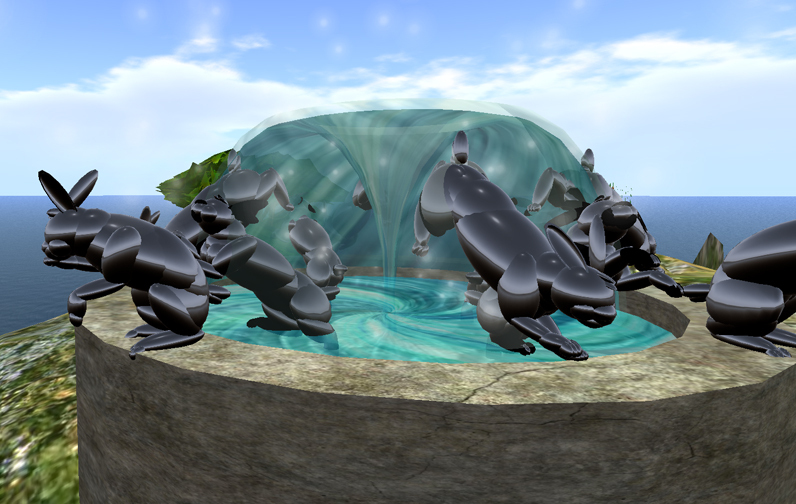 15,000 prims will be a snap to consume with such features as my 600 prim bunny fountain…. 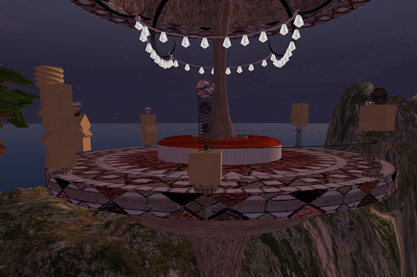 Prim count star date 5/11/2008: 30,280 in IBM OpenSim Shengri La Spirit. Yay!